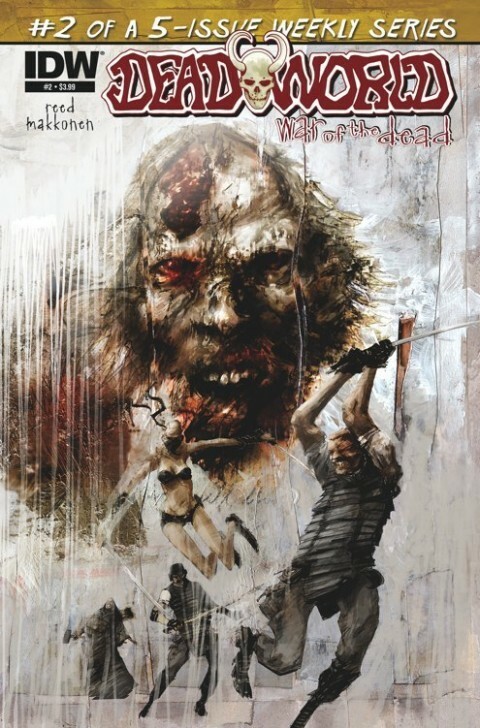 Largely due to the buzz deriving from the success of The Walking Dead, it would seem zombie-based comics are rather the norm lately as an increasing number of creators and companies attempt to capitalize on the success of Image’s flagship title. Dead World, published by IDW, is a five part story featuring a world overrun by zombies, where the remaining humans struggle to survive the continuous onslaught, while a select few actually aid the King Zombie in the execution of his master plan. 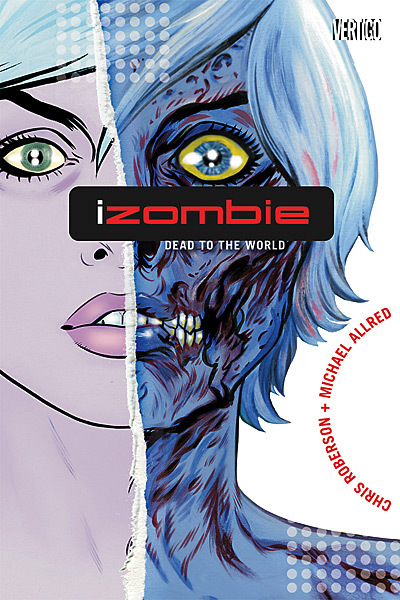 The second issue of the mini-series commences with a number of characters seemingly burning the body of a zombie; the person who appears to be the group’s leader explains the reasoning for burning the corpses and the need for sanitation as a whole to prevent the spread of bacteria. 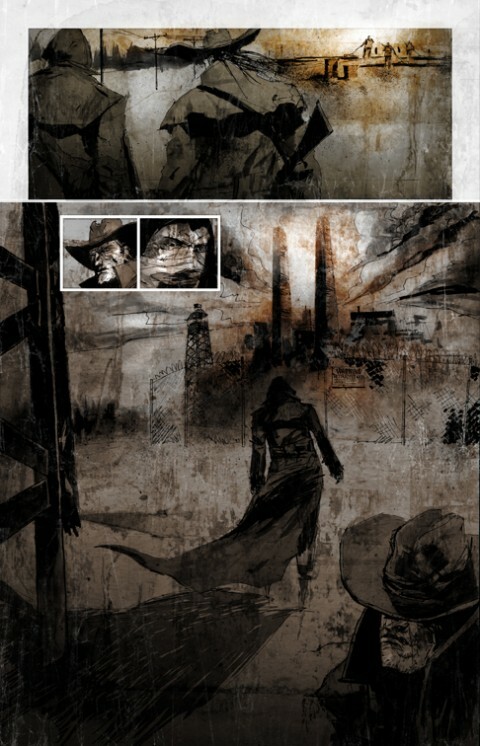 While the issue includes a short synopsis on the previous issue’s events, it feels inadequate as a summary for the story as issue two itself feels presumptuous with its plotting, bearing no explanations as to what caused the outbreak, the status of society as a whole or even who the characters are. 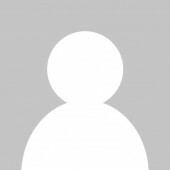 Assumptions can be made for example for the “leader” in the opening pages, as a person who is half human, half zombie named Donna is described in the inside front cover page summary, but their identity is unclear and can’t be conclusively discerned. This in itself takes away from the reading experience. The book takes another hit as the story jumps to a scene where a group of humans are on patrol and they run into a damsel who is revealed to be nothing more than bait for her companion, Tony, who quickly points his gun at the patrolmen upon this revelation. From there, a man in a cowboy hat named Dan arrives to rescue the patrol team. Here we learn a little more about humankind’s “Safe Haven,” as well as about Mike and Rand. The pages feel clunky, hobbling about the plot without explanation of what’s transpiring, leaving the reader a little disoriented. When the story shifts again to the King Zombie, that feeling is amplified, making the story feel as though it’s further along than it truly is. That in and of itself is a deterrent for new readers. What can be gathered though is that this world possesses a unique plot twist which places the King at the apex, while seemingly having enlisted a collective of humankind to do his bidding. Interestingly, the plot twists a little upon the reveal of the King Zombie’s master plan, making the book’s concept interestingly ambitious. It’s during this conversation that the reader is able to get a better feel for the story, with it aiming to be more of a commentary on humankind’s social underbelly and its disposition towards self-preservation. The following pages degenerate back into confusion, seamlessly slipping back and forth between character conversations and events without context or explanation as to their importance. Without that understanding, it’s difficult to really get or grasp the story. Makkonen’s work consists of very abstract line art with overtly horror-themed elements in this series. The abstractly drawn page depicting the burning pyre, the flames reaching high above the heads of the characters, is characterized by the slightly illuminated bodies of the people standing directly beside the blaze, while off in the distance you may view a number of silhouetted figures obscured by the darkness of night. While some of the wider landscape panels displaying more action or characters lack some details, the tighter “talking head” panels are very well done with clearly discernible facial features and expressions. The colouring is strangely dull however. While good for the most part, it’s hard to place the characters in some situations such as when Dan arrives to protect the two men from the woman and her companion’s ambush. There are abrupt colour shifts in the overall presentation of the panels, shifting between yellower tones to a cool green tone before an outright white, black and grey panel towards the end of the page. There’s no real reason for the eclectic colouring, making it unintentionally jarring. 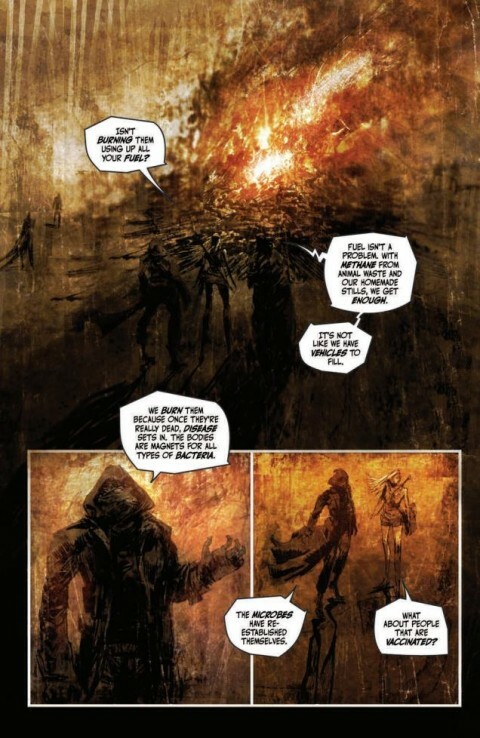 The art improves dramatically as a whole in the middle of the book upon visiting the King’s stronghold, continuing on through to the end of the book with very dark, post-apocalyptic work. 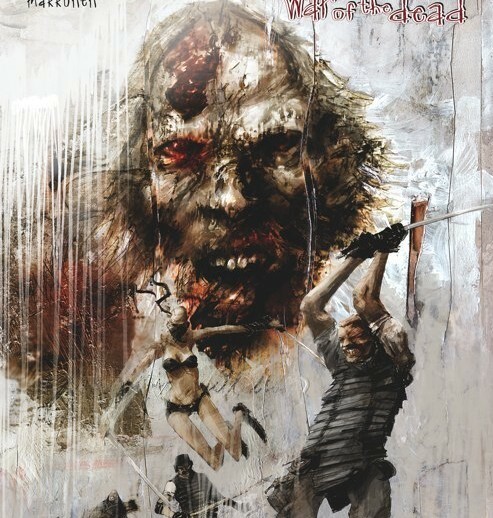 The book offers a different take on the zombie genre, making them fully functional ghouls capable of complex thought. 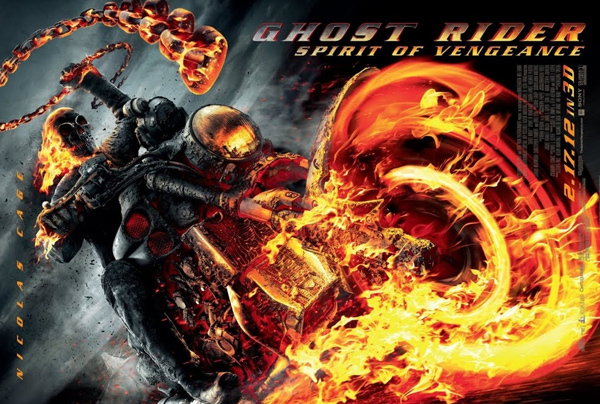 While conceptually the book is quite good, it falters a bit on its execution. 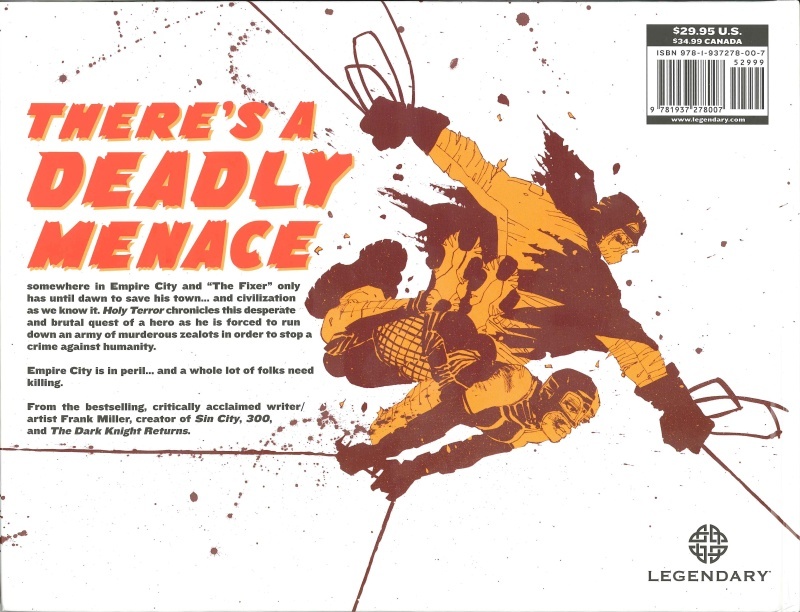 Without reading the first issue, the plot is difficult to understand or follow, making the series unfriendly in the absence of a clear introduction on the inside front cover. The storytelling itself doesn’t lend Dead World to readability, abruptly changing direction and pace all too often. The benefit of the series is that it is finite and will have a definitive end. As a zombie story, that makes the book attractive to the niche audience. While that may be so, the un-engaging characters and their plight takes away from the totality of the experience, making this a okay read in passing.